Argent, upon a base gules a castle triple-towered of the same ported and windowed sable with a cord issuant from the portal, pendent therefrom a key Or. The coat of arms of Gibraltar was first granted by a Royal Warrant passed in Toledo on 10 July 1502 by Isabella I of Castile during Gibraltar's Spanish period. The arms consists of an escutcheon and features a three-towered red castle under which hangs a golden key. 1st Division: Two thirds Argent, a triple-towered castle of Gules, masoned and ajouré of Sable. 2nd Division: One third Gules, a key of Or hanging by a chain also of Or from the castle. ...and we, deeming it right, and acknowledging that the said City is very strong and by its situation it is the key between these our kingdoms in the Eastern and Western Seas and the sentinel and defence of the Strait of the said Seas through which no ships of peoples of either of these Seas can pass to the other without sighting it or calling at it. The idea of Gibraltar being the key to Spain or the Mediterranean originated well before the Spanish conquest. The followers of Tariq ibn Ziyad, who invaded Spain via Gibraltar in 711, are said to have adopted the symbol of the key when they settled in Granada. The coat of arms was accompanied by the inscription "Seal of the noble city of Gibraltar, the Key of Spain". The coat of arms of the government of Gibraltar combines that of Her Majesty's Government and Gibraltar's own coat of arms. 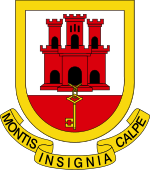 Today, the official coat of arms as used by the government of Gibraltar consists of the original coat of arms with the addition of the motto Montis Insignia Calpe ("Insignia of the Mountain of Calpe"; Mons Calpe was the Latin name of the Rock of Gibraltar), which was granted by the College of Arms in 1836 to commemorate the 1779-83 Great Siege of Gibraltar. It is the oldest coat of arms in use in an overseas territory of the United Kingdom and is unique in that it is the only armorial insignia that dates from before the period of British colonial administration. The arms differ from the seal of Gibraltar, which is an image of the Rock of Gibraltar with a sailing ship in the forefront. There is no evidence available as to when this image was created. From 1982, a banner of the arms has been used as the flag of Gibraltar. The arms also appear in the flag of the governor of Gibraltar. The arms of the government of Gibraltar are the same as the royal coat of arms of the United Kingdom combined with a badge featuring the coat of arms of Gibraltar. A very similar coat of arms is in use by the nearby Spanish municipality of San Roque, using a slightly different version of the same main heraldic elements (the escutcheon with the castle and key), with the addition of the old Spanish Royal Crown above the escutcheon. The coat of arms of the Campo de Gibraltar in an area that remained under Spanish control. The Royal Warrant of 1502 which granted the coat of arms was taken by the city council to San Roque along with Gibraltar's standard and records, and is now in the San Roque municipal archives. The establishment became a new town in 1706, addressed by King Philip V of Spain as "My city of Gibraltar resident in its Campo", and becoming the Spanish Gibraltar. Therefore, they kept the old coat of arms granted to Gibraltar in 1502. In 2015, the Commonwealth of the Municipalities of the Campo de Gibraltar (Cádiz) adopted a coat of arms and a flag. This new coat of arms shows the elements of the coat of arms of Gibraltar with seven green stars that represent the municipalities of the Commonwealth, two equal horizontal stripes (green and purple) with the colors of this organisation, and a bordure Or with its motto PRO GEOGRAPHIA, HISTORIA ET VOLUNTATE CONIVNCTI (Latin: For geography, united history and will). The modern Spanish Royal Crown is used as heraldic crest. Wikimedia Commons has media related to Coats of arms of Gibraltar. ^ a b "National Symbols". Government of Gibraltar. Retrieved 1 September 2012. ^ a b William Jackson (1990). The Rock of the Gibraltarians. A History of Gibraltar (Second ed.). Grendon, Northamptonshire, United Kingdom: Gibraltar Books. p. 72. ISBN 0-948466-14-6. ^ Alexander Slidell Mackenzie, A Year in Spain, p. 332. Hilliard, Gray, Little, and Wilkins, 1829. ^ Frederick Sayer (1862). The History of Gibraltar and of Its Political Relation to Events in Europe. p. 82. ^ Discover Pocket Guide to Gibraltar. p. 68. ^ Sáez Rodríguez, Ángel J. "Escudo de armas y bandera para el Campo de Gibraltar" [Coat of arms and flag of the Gibraltar Countryside] (PDF). The Commonwealth of Municipalities of the Gibraltar Countryside Website. Archived from the original (PDF) on 13 March 2016. Retrieved 12 March 2016. This page was last edited on 20 January 2018, at 11:14 (UTC).